Storms are due in tomorrow. It was a long, busy day today. Macho had worked in the front bed in our yard. He has it looking very good. I drank a little toddy to calm my busy mind. Then I took a stroll around the back yard. I found a dead bird on my patio. I donned my garden gloves, grabbed my trowel, and set out to bury her. The evening is quiet. Our Lady of Perpetual Vegetables was reigning near the oak tree. She came from Mom's house. Mom promised to buy a statue when Dad joined the church. This statue was at our old place at 890. Second street. After the storm she moved. With Mom and Dad. She stood sentinel by the pecan tree. Until last month. Then she came home with me. Now. She presides over our vegetable garden. And so. In the quiet of this evening I stopped. It was so quiet. Mom was so near. I shed a few tears. After the funeral I did go to Mom's house. Yet. Somehow my upcoming trip has me a little apprehensive about returning. I think I want her to still be there. My head knows she isn't. But my heart wishes she was. I still see her as "there". It will hurt to not have it be. I will come to you in the silence. This is a line from a hymn we sing at church. If I allow myself quiet time she does come to me. Her love is still alive. Notre Dame Cathedral in Paris burned today on the one month anniversary of Mom's death. I've never been to Paris, yet I feel how momentous it is to lose such a beautiful old thing. I find myself looking at recent photos of her, and her death seems a dream. Unreal. I miss seeing her face. I miss our fractured communication on FaceTime. I miss knowing she is there. I miss worrying about her. Lord help me navigate the sorrow. Help me keep her love alive. I would write about my Mother's hands. Adjust the ring with sapphires that was Dad's college pin. They care for children and a husband. On a black cookie sheet. They don't make them like that anymore. My mother's hands. They catch mardi gras beads for her and her grandchildren. At Dauphin Island becomes a wonderful find! Our Treasure. Write notes and send her love on its way with a stamp. My Mother's Hands. So competent. So caring. So useful. I love my Mother's hands. That is what I need right now. Just a few minutes to start the journey of navigating life without Mom. Oh. I know I will need more than just a few. Yet this is where I start. With a few minutes here and there to breathe. And remember. All the events of the last few weeks. Before her consciousness was gone she told us over and over "I love you. And I always will." It was more than precious time. It was blessed time spent with Mom. Last week felt so slow while it was happening. We watched her breathe. We held her hand. Sister soothed her by putting cool cloth against her sometimes burning skin. We sang (not so well but with great emotion). We prayed. And we prayed. We told her we loved her. Over and over. We told her to go on. Dad was waiting for her. Daughter. Sister. Nurse. That is what we were. We held each other. Mimi. Marsha. Amanda. Me. Peter when he could be there. Stephanie and Harry arrived Friday afternoon and then Paulette at about 3:00. The ides of March. 6:35 p.m. Her soul left her body. I opened the back door. A train was going by. I just can not find the words that say how it was. Every human being experiences the loss of their mother at some point. Each one. Yet. THIS one is so different and so personal. I felt it and feel it so profoundly. It brought me to my knees. Thank you, Mimi, for covering me in your love and giving me the strength to stand again and walk out of her house. Without you I think I would have cried myself into a puddle on the floor. In her last moments she saw beyond the room that held her. She spoke to heavenly beings. On her last Monday, in a clear voice, Mom said, "I'm finished. I'm through with what I have to do for now." 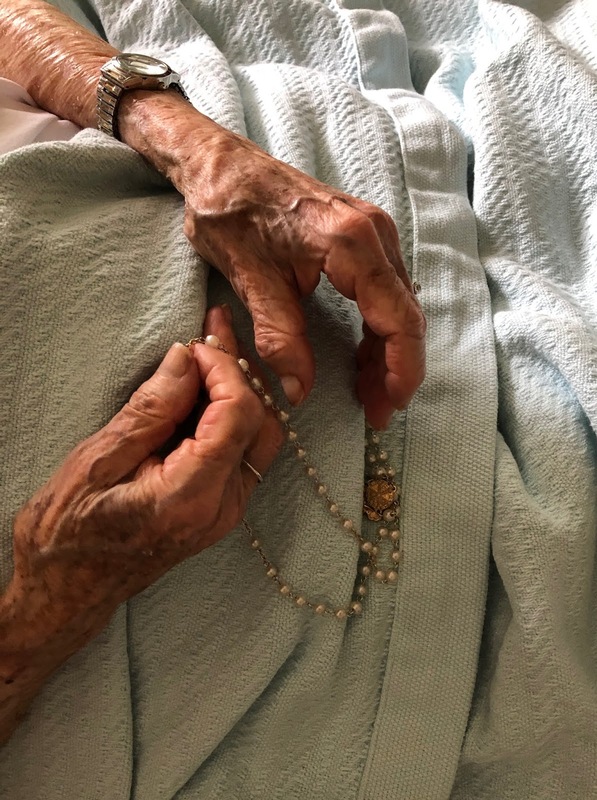 She held her rosary all the while she was conscious. And we made sure it was in her hand for all the rest of her life. There is a sweetness in her passing. I will forever see the spring with deeper appreciation. I do feel her love. Love never dies. She died when flowers were in bloom, not quite spring. How appropriate that I am reminded of new life just as my mother's body expires. And expire is just a great word to use to describe the experience. Surrounded by many of her children Mom's heart used up the last weak beats it was meant to use. It was a Friday, in the evening. All week we had prayed, laughed, cried, sang, and loved her well. Five of the siblings were present as time permitted through the week. Two more siblings joined us on Friday, in time to add more love and prayers before her soul took flight. I am so sad for me. For us. But I am so happy for Mom. I will see her in all the signs of spring as I consider her new life. Heaven is richer today. The week is being filled with extraordinary visuals. Just now, picture this, Andrea Bocelli and choir singing the Lord's Prayer, only to look up and see two sisters administering medication to our Mom with loving tenderness as she continues to march toward eternity. I will hold on to that image for a very long time. Precious hands of my mother as she makes her final journey. She is so strong, her little heart just keeps beating. I don't know how. Soon, very soon, she will see the face of God. Remedial art student. Happy to be in the middle ages.